Each digit of the hand has the ability to move freely throughout a full ROM into flexion and extension. The efficiency, fluidity, and forcefulness of such movement is made possible by several "pulleys" along each digit of the hand. These pulley systems are comprised of a series of retinacular-type structures that are either annular or cruciform in nature. There are five annular pulleys (A1-A5) and three cruciform pulleys (C1-C3). Trigger ﬁnger is thought to be caused by inﬂamation and subsequent narrowing of the A1 pulley of the affected digit, typically the third or fourth. 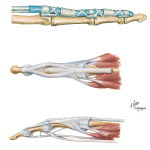 A difference in size between the flexor tendon sheath and the flexor tendons may lead to abnormalities of the gliding mechanism by causing actual abrasion between the two surfaces, resulting in the development of progressive inﬂamation between the tendons and the sheath. Commonly, trigger finger is referred to as "stenosing tenosynovitis." However, there have been histologic studies showing that the inflammation occurs more so in the tendon sheaths rather than the tendosynovium, making this name a false depiction of the actual pathophysiology of the condition. There have been many potential causes of trigger finger discussed throughout the literature. However, there is little to no evidence on the precise aetiology. Occupational-related causes of trigger finger have been proposed, but the research linking the two is very inconsistent. Authors suggest that trigger finger can manifest from any activity requiring prolonged forceful finger flexion (i.e., carrying shopping bags or a briefcase, prolonged writing, rock climbing, or the strenuous grasping of small tools). It is important to consider that the cause of trigger finger is often times multifactorial in nature. Trigger finger has a range of clinical presentations. Initially, patients may present with painless clicking with movement of the digit that can progress to painful catching or popping, typically at the MCP or PIP joints. Possible additional symptoms are stiffness and swelling (especially in the morning), loss of full flexion/extension, palpable painful nodule, and/or finger locked into a flexed position. Other signs and symptoms are slight thickening at the base of the digit and pain that may radiate to the palm or to the distal aspect of the digit. Diagnosis of trigger finger can be confirmed with the injection of lidocaine into the flexor sheath, which should relieve pain and allow flexion/extension of the joint. Imaging is not typically indicated, but ultrasound and MRI may be used to help diagnose other aetiologies. Patient is to actively make ten fists. The number of triggering events in ten active full fists is then scored out of 10. If patient’s finger remains locked at any time, the test is completed and an automatic score of 10/10 is recorded. Note: If the finger is locked, testing may not be possible. The chronic nature of the symptoms associated with trigger finger makes conservative treatment difficult and often frustrating. Still conservative care (listed below in PT Management) is always recommended as a treatment plan prior to surgical intervention. Corticosteroid use has shown to be effective in reducing pain and frequency of triggering. The shot is injected into the affected tendon and reduces the inflammation and pressure on the tendon for better gliding through the flexor pulleys. Application by a primary care provider is an effective and safe alternative to surgical therapy. Patient satisfaction, safety, and functional improvement are characteristics of steroidal injections in comparison to surgical treatment. Surgery is associated with higher costs, longer absence from work, and the possibility of surgical complications. Studies have also shown the combination of corticosteroid injections with lidocane to have significantly more effectiveness than lidocane alone. However, symptoms have shown to return longterm (4-6 mos) when treating with injections only. This technique, considered to be the gold standard, is performed by making a longitudinal incision in the palmar crease over the metacarpophalangeal joint of the involved digit and followed by release of the flexor digitorum superficialis and profundus tendons. This procedure lasts 2-7 minutes and has a longer average time of discomfort (45 days) post-op. An advantage to this technique is it allows the pulley to be visualized and therefore has less risk of damage to the digital nerves compared to endoscopic techniques. 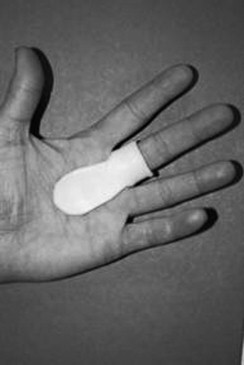 This technique is performed by making two incisions: one at the palmar crease over the metacarpophalangeal and the other at the volar crease of the finger. An endoscope is then introduced to cut the pulley releasing the flexor tendons. This procedure lasts 2-9 minutes and has a shorter average time of discomfort (23 days) post-op. Other advantages are absence of scars and scar related problems and shorter post-op rehabilitation. However, there is a large learning curve and the instruments are costly. This technique can be performed with or without imaging. Non-image-guided (blind) percutaneous release is performed by using anatomical landmarks to avoid injury to the tendons and neurovascular structures. The recovery time is shorter than an open surgery but chance for damage to digital nerves is higher, especially to digits 1, 2, and 5. A new technique using ultrasound-guidance helps clearly identify the tendons and neurovascular structures, preventing potential complications that are present with non-image-guided percutaneous release and it also compares favourably with surgical techniques. ↑ 1.00 1.01 1.02 1.03 1.04 1.05 1.06 1.07 1.08 1.09 1.10 1.11 1.12 1.13 1.14 1.15 Makkouk AH, Oetgen ME, Swigart CR, Dodds SD. Trigger ﬁnger: etiology, evaluation, and treatment. Curr Rev Musculoskelet Med. 2008;1:92–96. ↑ 6.0 6.1 6.2 6.3 Andreu JL, Oton T, Silvia-Fernandez L, Sanz J. Hand pain other than carpal tunnel syndrome (CTS): The role of occupational factors. Best Practice and Research Clinical Rheumatology. 2011;25:31–42. ↑ 7.0 7.1 7.2 7.3 Schöffl VR, Schöffl I. Finger pain in rock climbers: reaching the right differential diagnosis and therapy. J Sports Med Phys Fitness. 2007;47:70-78. ↑ 8.00 8.01 8.02 8.03 8.04 8.05 8.06 8.07 8.08 8.09 8.10 Colbourn J, Heath N, Manary S, Pacifico D. Effectiveness of splinting for the treatment of trigger finger. Journal of Hand Therapy.2008; 21(4):36-343. ↑ 9.0 9.1 9.2 Tendon trouble in the hand: de quarvain's tenosynovitis and trigger finger. Harvard Women's Health Watch.2010:4-5. ↑ 10.0 10.1 10.2 10.3 10.4 Howitt S. The conservative treatment of trigger thumb using Graston techniques and active release technique. JCCA. 206;50(4):249-254. ↑ Peters-Veluthamaningal C, van der Windt DA, Winters JC, Meyboom-de Jong B. Corticosteroid injection for trigger finger in adults. Cochrane Database Syst Rev. 2009;(1):CD005617. ↑ 12.0 12.1 12.2 Peters-Veluthamaningal C, Winters JC, Groenier KH et al. Corticosteroid injections effective for trigger finger in adults in general practice: a double-blinded randomised placebo controlled trial. Annals of the Rheumatic Diseases. 2008;67;1262-1266. ↑ 13.0 13.1 Pegoli L, Cavalli E, Cortese P, et al. A comparison of endoscopic and open trigger finger release. Hand Surgery 2008;13(3):147-151. ↑ 14.0 14.1 Rajeswaran G., Lee J.C., Eckersley R., et al. Ultrasound-guided percutaneous release of the annular pulley in trigger digit. European Society of Radiology. 2009;19:2232-2237. ↑ Yung E, Asavasopon S, Godges J. Screening for head, neck, and shoulder pathology in patients with upper extremity signs and symptoms. Journal Of Hand Therapy [serial online]. April 2010;23(2):173-186. Available from: CINAHL Plus with Full Text, Ipswich, MA. Accessed November 23, 2011. ↑ 16.0 16.1 16.2 16.3 Salim, N., S. Abdullah, J. Sapuan, and N. H. M. Haflah.Outcome of corticosteroid injection versus physiotherapy in the treatment of mild trigger fingers. Journal of Hand Surgery (European Volume) 0th ser. 0.0 (2011): 1-8. November 19, 2011. ↑ 17.0 17.1 Watanabe, H., Yoshiki Hamada, Tadahito Toshima, and Koki Nagasawa. 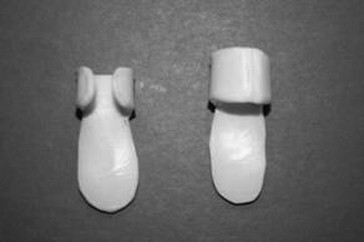 Conservative treatment for trigger thumb in children. Archives of Orthopaedic and Trauma Surgery. 2001;121(7):388-90. ↑ Yildirim, P., Gultekin, A., Yildirim, A., Karahan, A. Y., & Tok, F. (2016). Extracorporeal shock wave therapy versus corticosteroid injection in the treatment of trigger finger: a randomized controlled study. Journal of Hand Surgery (European Volume), 41(9), 977-983. ↑ Seok, H., & Kim, S. H. (2013). The effectiveness of extracorporeal shock wave therapy vs. local steroid injection for management of carpal tunnel syndrome: a randomized controlled trial. American journal of physical medicine & rehabilitation, 92(4), 327-334. ↑ Akhtar, S., Bradley, M. J., Quinton, D. N., & Burke, F. D. (2005). Management and referral for trigger finger/thumb. BMJ: British Medical Journal, 331(7507), 30.